The vision of the Cluster leads to our Research Program which is formally structured in three Research Areas, which are each subdivided in three Thrusts. The Cluster of Excellence 3D Matter Made to Order combines the research competencies of KIT and Heidelberg University bringing together researchers and creating innovation and synergies in an enriching environment. Seizing the complementary strengths of the two universities, the Cluster pursues a highly interdisciplinary approach combining natural and engineering sciences. This means that the 25 Principle Investigators of the two universities bring together a wide variety of scientific backgrounds, ranging from biology, chemistry and physics to engineering and material sciences. The Research Program is divided into three Research Areas, each of which is comprised of three Thrusts. 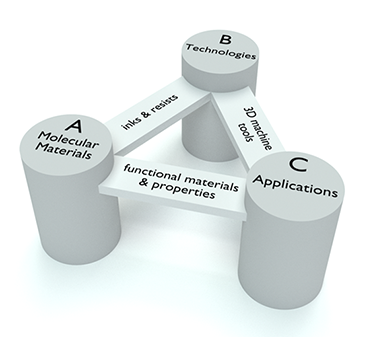 This structure matches the vision as it represents the three interdependent steps in the development of scalable digital 3D Additive Manufacturing. Research Area Molecular Materials (A) focuses on designing novel molecular “inks” and “resists”, thereby providing the basic building blocks. Research Area Technologies (B) is concerned with advancing the technology of 3D Additive Manufacturing in terms of spatial resolution, speed, scalability, and multi-material printing. The joint advances of Research Areas A and B will create a “technology push”. Building on this “push”, Research Area Applications (C) explores possibility of novel applications in materials and life sciences.